What if all those stars are notes? I’ve sat and reflected, prayed, and just all together rehashed my feelings on this for the last two weeks. 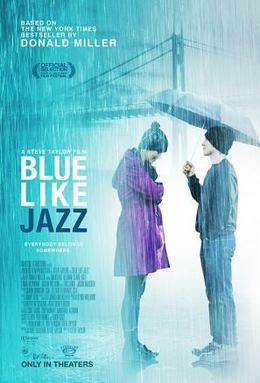 Myself and a couple of Burrito brothers went to our local indie style theater exactly two weeks ago tomorrow, to see Donald Miller‘s movie adaptation of “Blue Like Jazz“. The book is dear to many of us, and plays a major part in how we’ve framed much of our thought process moving forward in our ministry. When the movie was announced, we were all very excited and happily took roles in the street team to promote the release. The excitement was palpable in our weekly get togethers as we discussed themes from the book, and even used one of the discussion guides to gain some insight on the themes. Needless to say, we were more than happy to hear it was finally coming to Roanoke about three weeks after its initial release. We got to the theater and bought our drinks and pop corn, chatting about how big of an impact we felt this movie would have, and just how strong the impact of the book has been. As we sat down in the theater and the lights darkened, we were in full mode of prayer, ready to take it all in. The movie starts by explaining the parts of a story, and how a young Donald Miller related it to the word SuCCeR: Setting, Conflict, Climax, Resolution. It was obvious this would be the framing for the film, and I was excited. After the initial placing of the movie, the absolute shock and awe began. For the next 30 – 45 minutes, I was taken so aback, I could not begin to believe I was watching the movie I had come to see, almost nothing resembled the book, and for a while, it seemed like the goal of the movie was to make you uncomfortable and push fans of the typical Christian movie strait out of the theater. There was no struggle as seen in the book, just rejection and what seemed to be a movie to provoke every Christian by virtually every means possible by the title character and his on screen cohorts. As the movie continued, I very much noticed the lack of a person that I thought was a wholly central character, Tony the beatnik poet. I wondered how the most absolutely beautiful and most powerful piece of the book would come to fruition without his presence. As the movie continued, I started seeing the arc build that would bring us back to an ultimate end, but I continued to wonder how much building of the Conflict piece was needed. The central pieces of the book, and pieces that only fans of the book continued to make their way in, which I appreciated, but I was still at a loss for how different this movie truly was from the book. Finally, Ren-faire was upon us, and an explanation given for how the resolution would hash out (that is, if you were already familiar with the book). The time for resolution came, and in what seemed like ripping the band aid off as quickly as possible, it was over. I had to wonder if I truly felt resolved, and if I had truly seen the events and messages that could truly have the impact I saw in the potential of this film. So, here I am, two weeks later, after truly reflecting on what I experienced, and how it all works out. In summary, the movie is a TERRIFIC movie based on the budget it was given, and it gives me true hope for the future of independent movies with similar goals. As far as the potential impact, I think that the target audience, is definitely those who have completely distanced themselves from Christianity, those that have been wronged by “Those types” of Christians I should say, but for those with general questions, or perhaps those that are already moving towards Christ, I can’t say it would necessarily add much to their decision. That being said, it is still absolutely a movie that I think everyone should see for the sake of conversation, and a film that gives real credibility to the “emergent church” folks that are trying to revitalize faith in today’s world. I’m excited to see if the DVD release can further it’s impact, and perhaps even continue to start conversation.